Thank you for your detailed feedback. We strive to continuously improve our clients experience in every aspect. We would request you to please give us one more day...We are working on the revised version...As discussed, we will make the required changes and resubmit the article .. Thank you for your patience and support!! We have submitted the revised article :-) .. Please check and give us your feedback. Thank you! Good article! It definitely shows the benefits of wi-fi and how important it can be for the tenants. I think to make this article a winner, it just needs to be slightly tweaked so that it is more oriented towards property managers, since these are the clients we are looking to attract. 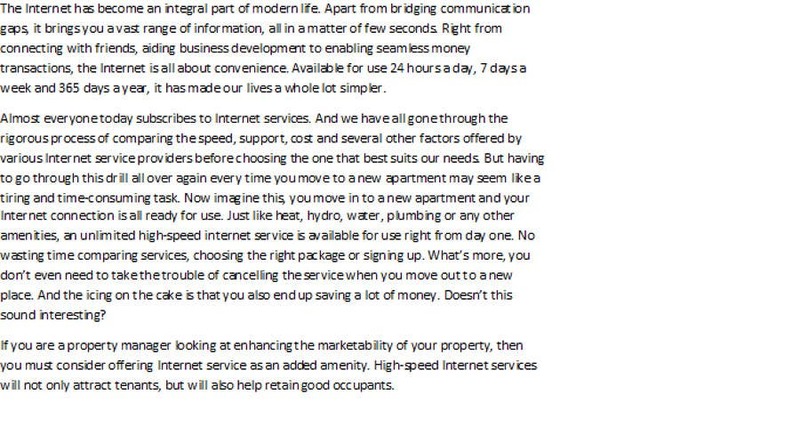 You do a good job within the third paragraph, of targeting property manager's. Now we just need to get that aspect into the first few paragraphs so that PM's will be captivated and intrigued right off the bat. Great job so far, looking forward to seeing a revised version!